Please join the Select Committee on Energy Independence and Global Warming for a Staff Briefing on distributing emission credits under a carbon cap-and-trade system. This briefing is open to all staff and the public. Just a few hours after its release in Europe, a new global warming pollution auction-and-trade system will arrive on American soil tomorrow morning at a hearing before the Select Committee on Energy Independence and Global Warming. A leading figure in the European Commission’s carbon market will appear before the Select Committee to discuss how the European Union has shifted from a pollution trading scheme where credits are given out for free to a system where companies must bid on credits. The hearing will examine the role of auction or allocation systems for global warming emissions credits in a cap-and-trade climate bill. Along with several prominent witnesses from the United States, Peter Zapfel, Coordinator for Carbon Markets and Energy Policy, European Commission – Environment Directorate General, will cover these new developments in the E.U. Tomorrow morning’s Environment and Public Works markup of the Lieberman-Warner climate bill (S. 2191) promises to be long and contentious, quite possibly to be extended to Thursday. Republicans have proposed over 150 amendments, with Sen. Craig offering 46; EE News reports they expect votes on upwards of 50 of the amendments. Democrats have submitted about 30 amendments. Below is a summary of the amendments the senators of the committee are planning to submit, in addition to Sen. Boxer’s manager’s mark. Major amendments include Sen. Clinton’s two amendments. The first establishes 100% auction of permits, and the second dramatically restricts CCS funding. Sanders #4 establishes an 80% target and #7 limits total offset permits. Vitter #10 restricts ownership of allowances primarily to covered entities. Carper #1 places caps on traditional air pollutants and Carper #2 bases permit giveaways to power sector on historical electricity production, not emissions. Isakson proposed various pro-nuclear amendments. Friends of the Earth has highlighted five amendments they support. Isakson proposed four amendments, three of which support nuclear energy. Amendment 3 prohibits the enactment of a cap without sufficient known technology, an amendment which failed in subcommittee. Bond proposed eight amendments. 1-6 are designed to protect consumers and industry against economic harm through various means of limiting emissions reductions. Amendment 7 provides a liability system for carbon sequestration. Amendment 8 supports CCS technology. Amendment 1 funds the management activities of the federal agencies involved by selling allowances. Amendment 2 increases allowance allocations reserved for mass transit support from one to two percent. Amendment 3 directs auction proceeds to a Global Environmental Monitoring Systems Fund. Inhofe proposed approximately 45 amendments, some of which are joke amendments (#12 “directs 20% of all auction proceeds be used to build homeless shelters for families without shelter as a result of job displacement due to this Act”). Amendments #23-#28 are pro-nuclear. Amendment #32 increases the auction percentage to 100% by 2029. Amendment #38 overrides the Massachusetts vs. EPA decision. Craig proposed 46 amendments, many of which add other legislation into the bill. Amendments 2-10 deal with forestry provisions. Amendments 11-20 are “technical” corrections. Amendment #36 allows offshore natural gas drilling. Various amendments scattered throughout deal with nuclear power. 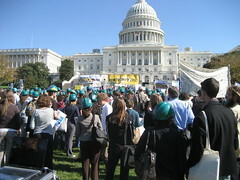 Today saw thousands of Power Shift participants coming to Capitol Hill for a day of testimony before the House Global Warming Committee, a large rally on the Capitol steps, and perhaps most importantly, hundreds of meetings with staff and legislators. The youth activists introduced the 1Sky platform and asked for a commitment to the goals of making green jobs, strong emissions cuts, and no new coal top climate legislation priorities. They also called for 100% auction of pollution permits, and for an energy bill with the Senate 35 MPG standard, the House renewable energy standard, the Green Jobs Act, and no coal or nuclear subsidies. The Lieberman-Warner bill will reward corporate polluters by handing them pollution permits worth almost half a trillion dollars. And that’s just one part of this bill. The bill also includes hundreds of billions of dollars of other mind-boggling giveaways. The levels of pollution-rewarding giveaways in this bill are truly obscene. In calculating the value of emissions allowances, FoE follows the estimates of EPA’s analysis of McCain-Lieberman (Climate Stewardship and Innovation Act of 2007, S. 280) which estimated that between 2015 and 2050, the price of emissions permits would increase from an average of $14 to $78 per ton of carbon dioxide equivalent greenhouse gas emissions.